Mix butter and sugar in a large bowl with a wooden spoon. Add egg yolk and vanilla, briefly beat to combine. Sift flour into mixture until well combined. You might need to use your hands at the end to give everything a really good mix and press the dough together. 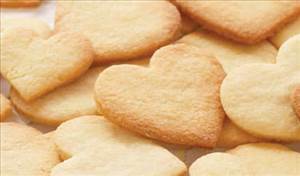 There are 84 calories in 1 serving of Basic Biscuit Dough. Calorie Breakdown: 35% fat, 60% carbs, 5% prot.